Browse our range of kilts for kids. 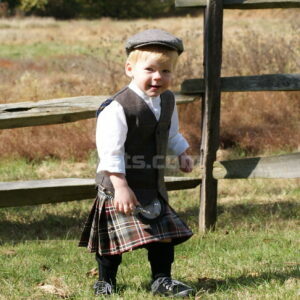 If you are struggling to find the perfect kids kilt, we are sure you will love our children’s kilts. Fantastic quality kilts that are made of Poly Viscose material. This is a material which is a mixture of polyester and viscose, which is coated in a thin layer of Teflon, to make the kilt extremely hard wearing and it can therefore be washed and wiped. You couldn’t do this with a traditional woolen kilt. We know that your child will be growing, so with each kids kilt, we have added a 2 inch hem which means the kilt can be altered as your child grows. This is a kilt built to last! If you need any help with deciding on which tartan to go for, or for which size to buy, please don’t hesitate to contact us. We are on hand to provide you with the best advice for your children’s kilt.